Hair Growth Formula has been formulated with ingredients necessary to fight hair loss. The rich ingredients stimulate your hair follicles and promote hair growth while strengthening your hair. Our Hair Growth Formula targets the dermal papilla cells which are the key to hair growth cycle. Specifically, biotin is a B-vitamin that serves the vital roles of breaking down important macronutrients and other compounds that the body needs, including fats, carbohydrates, and amino acids. Without enough biotin, your body cannot properly synthesize protein, which means it cannot create keratin. The human body also cannot produce enough vitamin D without proper biotin levels, and vitamin D is crucial when it comes to immune system strength. These are just a couple of the most important functions of biotin in the body. A 2015 study followed a similar procedure, with digital images of each participant’s scalp used for comparison after 90 days. Similar biotin for hair growth results were recorded, this further supporting evidence that biotin can aid in healthy hair growth and can even help to reduce future hair loss. Many people who have taken biotin supplements for hair growth have also noticed their hair seems healthier, stronger, thicker, and shinier. This, again, is likely due to the increase in keratin production associated with the body’s improved ability to break down certain nutrients. This can also result in overall healthier skin and nails. MSM is sulfur- one of the principle building blocks of hair (and nails). So MSM helps hair growth because it gives your body a building block for hair. But besides just contributing one of the main building blocks of hair, it is also theorized that MSM increases hair growth potential by lengthening the growth phase (anagen phase) of the hair cycle. Moringa is a tree also called “the tree of life” or “Miracle Tree”. Moringa plant benefits hair growth, prevents dandruff and does much more. How? It contains more than 90 nutrients and 46 types of antioxidants. Just continue reading to learn why you should try this supplement to grow stronger and healthier hair. 1. The Iron in Moringa Brings Oxygen to the Roots - Iron deficiency has been linked with hair loss for years, now, making iron a logical ingredient for healthy hair growth among women. This is because iron helps carry oxygen in the blood, all the way to your scalp. When any living organism has a fresh supply of oxygen it grows better, including your hair follicles! Moringa is one of the top vegetarian sources of iron. Just one serving of our Kuli Kuli moringa powder will give you half of your daily recommended iron! 2. 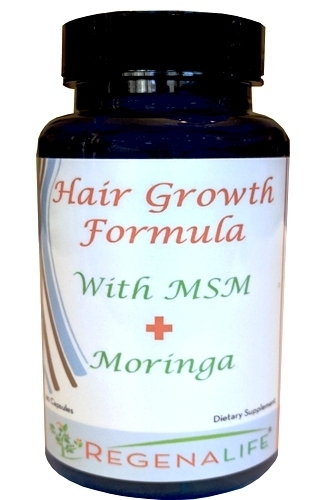 The Zinc in Moringa Stimulates Hair Growth - Zinc is probably the biggest player in this hair game. Not only has low levels of zinc been linked to poor hair growth, and even hair loss, it has also been shown to help improve hair growth and help damaged hair follicles recover more quickly. Zinc is a very important contributor to healthy hair follicles, which are literally the root of every single hair on your head. Moringa is packed with amino acids, the building blocks of cells. There are a handful that are particularly important in hair growth—arginine, cystine, cysteine, lysine, methionine—all of which are abundant in moringa. Many people are lacking in the essential amino acids because of a poor or unvaried diet. A serving of moringa each morning, though, can give you exactly what you need!